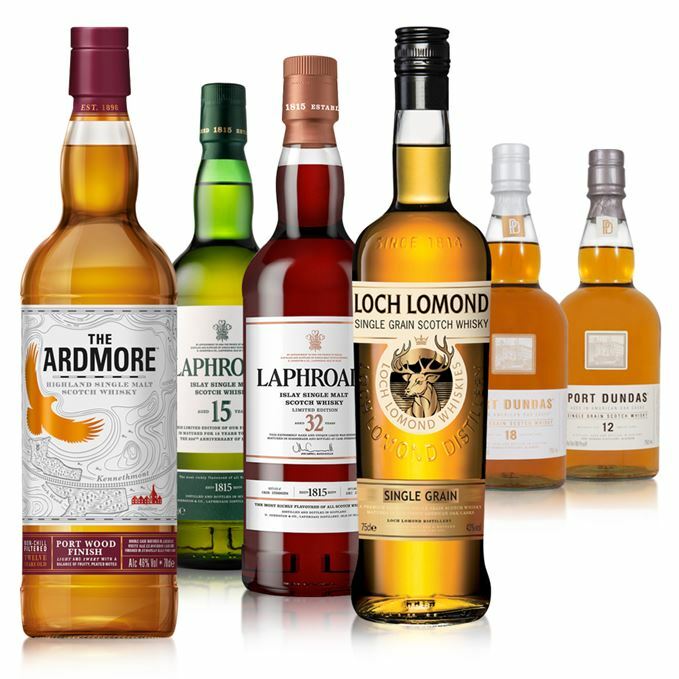 An equal split between malt and grain this week, and peated and unpeated, encompassing a pair of Laphroaig bicentenary releases, a new Ardmore, two grains from Port Dundas and the first of a tranche of releases from Loch Lomond – all assessed by Dave Broom. Sweet and also quite thick, with elements of membrillo, medlar and some subtle woodsmoke behind redcurrant and a hint of sloe. Some oxidised elements – steamed fruits – as the smoke begins to grow. The fruit element gets slightly overripe and, with water, allied to cherry tree bark. Have neat. A clean, quite crisp start, while the mid-palate is well-fruited and soft with those overripe, bletted fruits. The smoke is held back a little. It’s a bolder Ardmore with some fatness, but isn’t necessarily fully defined. Plump, generous, easy-drinking, with sound distillery character. A very decent dram. More Ardmore, please. Making jam from windfall fruits. The first impression is of oil, rather than smoke, then comes a lovely soft fruitiness which could almost be mistaken for Bowmore in its tropical nature. The smoke begins to inch forward, then shifts to wet kelp and some sweetness. Water brings out more of the oils and more exotic soft fruits as well. Dry, with burnt sticks, cold embers, but ripe fruits. The smoke is now more overt, while with water it becomes considerably drier and more rounded. At its best neat. Clean, lightly phenolic, if a little abrupt. It might not be the boldest Laphroaig, but it has a lovely balance. Wrapped in kelp, the baby sea otter begins to dream. Richer in colour than the 15-year-old, but with a slightly more shy nose. There’s a funny lactic note before an unmistakable brininess comes through – sea-soaked timbers, seaweed and then real sweetness that brings in apple, resin. The smoke influences everything, while never dominating. Classic Laphroaig oiliness remains, before there’s blackcurrant (leaf and skin) and, in time, more cereal (steeping porridge oats). An old, mature nose. Water makes it a little too dry. A gently muted entrance. Quite subtle and, like many old whiskies, you need to sip and allow it to flow slowly across the tongue. There’s touches of menthol and eucalypt which back up the balsam of the nose. The smoke has now receded. Not very long, but smoky. An excellent, subtle Laphroaig, though a scarce one. Fresh off the old trawler, bit of a cough. Soon sorted out. Fresh, vibrant, yet gentle with a real lemon zest lift. There’s an interesting flour/flower thing going on. An aromatic grain with real character. In time, there’s a hint of Dolly Mixture esteriness and, with water, green banana. Bright and cheery with those floral notes more obvious. The sweetness is now a dusting of icing sugar on beignets. Clean with excellent acidity. It’s young, but it isn’t in any way immature. Fresh, but just a little short. The first of a plethora of (hugely welcome) new releases and reformulations from the revived Loch Lomond (that’s LOW-mond, not Lo-MOND – see below) distillery, of which more next week. Taking a bunch of flowers to your love in New Orleans. Robust and rich, with some wood influence that provides elements of citrus and crème caramel, ginger, fermenting pineapple, toffee apple and chocolate. Water brings out light sulphur, then a powdery element, but there’s sufficient weight on show. Clean and sightly lighter than the nose suggests – some fennel – before the sweet oak, here seen as Muscovado sugar, begins to develop. Coheres in the middle, showing chocolate, caramel and a chewiness. It hints (weirdly) towards heavy column still rum. With water, that slight separation between distillate and oak is accentuated. Port Dundas was always a more muscular style of grain and this is shown perfectly here. I like it. And (writes one irritated Glaswegian) it’s Port Dun-DAS, not DUN-das). In similar vein to the 12-year-old, but more supple. Again, this shows good weight with some apple, crème brûlée and, with water, a little almond. More of a palate-led grain, with clean, oxidative notes, a little wood and some rich, sweet, honeyed flavour. Sugar puffs, ripeness and a chewy texture. Water brings out oak, with this dense, sweet and almost burnt note. Long, with dark chocolate elements. Great to see another new grain brand. Let’s hope there’s more to come. Oh… they closed it?! Shades of Bernheim? The Honey Monster sitting too close to the fire. Batch 14 30/10/2015 A duet of Dalmores, a brace of Bunnahabhains, plus a new Benromach and an Arran limited edition.